As December rolls in and the holiday season is in full swing it's easy to get lost in the holiday madness. Luckily, we’ve planned ahead and got you covered with IAC news. We’re throwing an IAC holiday party on December 21st and running a Toys For Tots Toy Drive for an entire week. We’re also fully stocked with IAC merchandise for the shopping season- new beanies, windbreakers, crewnecks, t-shirts, gift cards and more! You can stop by the brewery to shop for these items or shop online here. Happy Holidays! Come celebrate the first day of winter with us! We’re hosting a holiday party at the brewery on December 21st! It's an ugly sweater party with prizes for the most ridiculous sweater, so get creative and wear the craziest sweater you've got. There will be Christmas music and movies, so stop by for a festive evening! More details to come. IAC will be hosting a Toys For Tots Toy Drive the week of 12/11-12/17. Bring in a new, unwrapped toy anytime during that week and get a pint of your choice for only $.01 (Limited 1 pint per customer, but bring as many toys as you'd like). This month’s specialty pizza is Veggie Supreme! 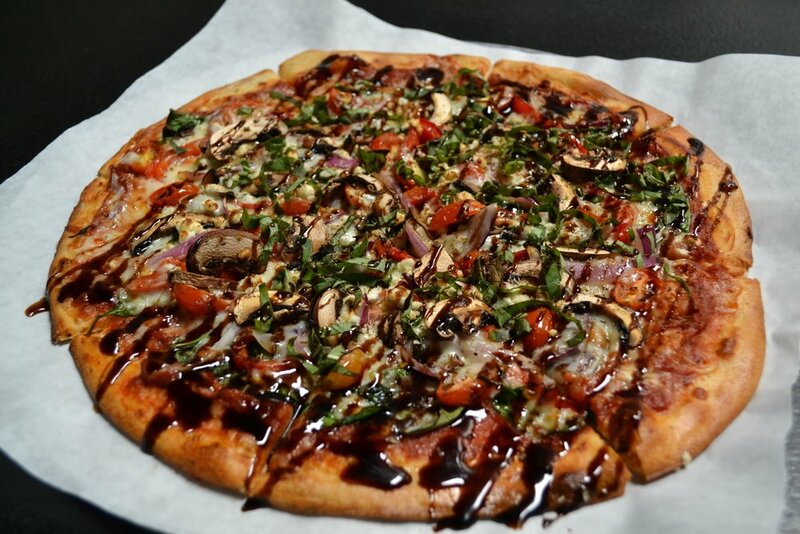 The Veggie Supreme has mushroom, spinach, tomato, red bell pepper, basil, oregano, goat cheese and mozzarella topped with a balsamic drizzle. This pizza pairs great with our session IPA, Illusion. New Canning Line at IAC! We recently installed our new canning line at the brewery in November. You can expect small canning runs of limited release and one-off beers to be released regularly. The new canning line sits right outside the viewing window in the tasting room so you might catch us canning at the brewery during one of your visits. Expect new can releases for later this month! Follow us on social media for specific can release updates. Join us from 7pm-9pm every Tuesday night for beer and brain teasers! Winners receive IAC gift cards. Lockdowns only happen once a month and feature a special guest brewery and their favorite beers on tap at IAC. This month’s Lockdown will feature Ventura Coast Brewing Company! VCBC will be here on December 27th to hang out and pour some of their brews! Don’t miss out on this one night only event. More details to come! These beers will be getting tapped in the tasting room soon. Follow us on Instagram, Facebook, Snapchat and Twitter for exact release dates! Our annual winter stout is back! A straight up imperial stout loaded with tons of dark malts. This big stout finishes rich and slightly sweet with mild bitterness for balance. Complex, a touch boozy and perfect for a chilly night. New IPA recipe with Mosaic, Citra, Cascade, Chinook and Columbus hops. Super dry and hop forward. Our flagship IPA hopped with Columbus, Mosaic, Simcoe and Centennial. This time we added Mango and Habaneros giving it a tropical fruitiness and clean, sharp spiciness. One of our original beers, Sedation combines malty and toasty flavors with floral and citrusy hop flavors. It's brewed with Centennial, Cascade and HBC-342. A new, lower ABV stout with a rich and creamy mouthfeel. A combination of roasted and caramel malts create flavors of coffee, chocolate. The same recipe as regular Batch 219 but served on nitro. A brand new double dry hopped pale ale. Amarillo, Mosaic and Simcoe hops. Be on the lookout for this beer to be released in cans! A brand new double IPA! Cascade, Mosaic and Simcoe hops. Be on the lookout for this beer to be released in cans! A re-brew of Batch 189. Unfamiliar Skies is one of our new favorites - sharp West Coast bitterness with plenty of piney and lemony hop character. Our annual holiday ale will be tapped later this month. It’s a lighter bodied oatmeal stout, rich vanilla and cocoa flavors complemented by a slight fruitiness and sweetness from the addition of raspberries. Here's what's on tap currently in the tasting room as of December 1st. Visit www.institutionales.com/on-tap/ anytime for a daily updated tap list. IAC Holiday Party (Thursday, December 21st): We’re hosting a holiday party at the brewery! It's an ugly sweater party with prizes for the most ridiculous sweater, so get creative and wear the craziest sweater you've got. There will be Christmas music and movies, so stop by for a festive evening! More details to come. Lockdown: Featuring Ventura Coast Brewing Company (Wednesday, December 27th): This month’s lockdown will be featuring our friends from VCBC! Join us at the brewery on December 27th and come hang with the VCBC crew and try some of their favorite beers! More details to come.